Visitors to the Atelier in Molsheim are always intrigued to see the Veyron’s high-tech components being meticulously assembled into an automotive work of art. Watching the car coming together, coupled with an admiration for the technical beauty of its structure, gave the designers the idea of finishing the car in its pure material configuration – meaning no colour coating. The result is the EB 16.4. 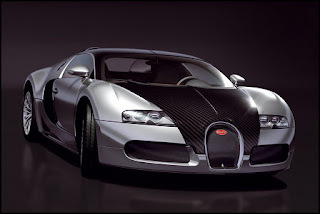 Veyron “Pur Sang”, a two-tone study of pure materialness showing the car’s true essentials: carbon and aluminium. The carbon monocoque holds the engine plus the passenger cell, while the polished aluminium panelling is enhanced by reflections in the sculpted bodywork. Interestingly, the rawness of the materials even more strongly highlights the dual character of this car: performance power coupled with cruising comfort, structure and body, dark and light. A closer look at the details reveals the technical logic behind this stylistic appearance. The sophisticated monocoque contains all the core structural components, including the W16 engine, the passenger cell, the crash box and the linkages to the wheels. It is this purpose-driven fundament that is visible as the centre of the car in clear-coated carbon fibre. Equally consistent is the use of the aluminium panelling. This lends shape and a unique body sculpture to the car, covering the wheels in a muscular and powerful expression by way of elaborately shaped fenders. Highly polished, these perfectly tensioned shapes strongly visualize the fascinating surface reflections that define every Veyron. The balanced graphic appearance is also visible when looking down onto the car from above. These qualities take on a distinct appearance – almost like that found in a Mondrian painting. As its pur sang label suggests, this individualised customer car shares the same kind of DNA as that of classic cars from the Bugatti past: the “Atalante”, the Type 55, the Type 41 “Royal” all had an unmistakeable and characteristic graphic signature. It is this precise division of performance components and body panelling – in this form – that makes the EB 16.4. Veyron “Pur Sang” unique in the supercar world.